The sprint superstar Usain Bolt seems to make his first start as a professional footballer on Friday, a challenge he could find out if he has a future in the sport of his youth dreams. 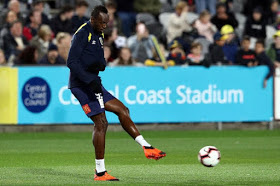 Bolt said the coach of his Central Coast Mariners, Mike Mulvey, had hinted that he would be in the starting eleven in a friendly against Macarthur South West United in Sydney. "For me it's always a good step, if the trainer is happy with your fitness to get you started - that's always a big step," Bolt said Wednesday in Mariner's Club Media. "I'm just happy to get the chance and go out there and start doing my best, because that's the most important thing." The eight-time Olympic champion made his football debut at the end of August in a 20-minute cameo as a substitute on the left side.